Best of all, streaming DirecTV Now won’t count against your data when streaming on iPhone if you’re an AT&T customer. The new service comes with a free seven-day trial period, after which you’ll be billed $35 for the lower tier package with 60-plus channels. Other bundle options include 80-plus channels for $50 per month, 100-plus channels at $60 per month and 120-plus channels for $70 a month. You can also add premium channels like HBO and Cinemax for $5 each. Apple was reportedly working on a service similar to DirecTV Now but abandoned the project because it could not strike the right deal with networks. Instead, Apple has focused on unifying the viewing experience by creating a new TV app for iOS devices and Apple TV that puts all your content in one place. To promote the new DirecTV Now service, AT&T will give customers a free Apple TV or Amazon Fire TV if you sign up for three months. Some of the most popular networks in the United States are listed among the channels, although CBS, Showtime and the NFL Sunday Ticker are notably absent from the offerings. Subscriptions to DirecTV Now will get you access to big networks like ABC, FOX, NBC, ESPN, Cartoon Network, TNT, AMC, FS1, FX, Comedy Central and a host of others. 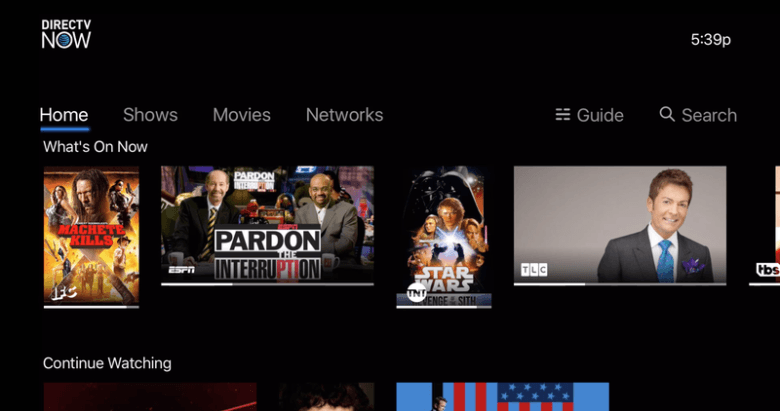 DirecTV Now is also available on the web, Android, PC and Chromecast. The technology lets you can pick up where you left off on pretty much any device with a screen and an internet connection.